Retail $16.50 SAVE 20% ! Versatile and easy to construct gear box broadens the world o handicrafts.. Allows 2 gear ratios, 11.6:1 and 18:1 to be selected..
Polyacetal resin gears permit efficient power transmission with les mechanical noise than metal gears.. 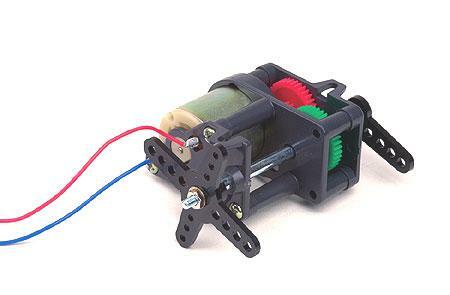 Accepts 140 or 260 type motors.. Included motor operates on 3-4.5V..
Keep away from children under 3 years of age due to choking hazard..